In this month of November – before the holidays are in full swing – it is the perfect time to set goals for the new year! Take a moment and think about what you want to achieve in 2015. If you will do this and follow the practice below of making them SMART goals, when the new year rolls around, you will find that you are well on your way to achieving them! So, write out your goals and then measure them against this acronym. Ask yourself, is this goal Specific? The more specific your goal, the more likely you will be to achieve it. For example, having a goal of going on vacation is not as specific as having a goal to go on vacation at Disney World in Orlando, Florida in August. Next ask yourself, is this goal Measurable? To measure a trip to Disney World, you might first find out how much the entire trip will cost, i.e., travel, hotel, admission. If you are saving for the trip, you would determine how much you would need to save each month for the next seven months (Jan-July). As the months progress, you can measure how close you are to reaching your goal by looking at how much you have saved. The next question: is this goal is Action-oriented? A goal cannot just be a hope or a dream. It has to be something where you can take action. In our Disney World example, you can take action by saving the money for the cost of the trip, scheduling vacation time with your job, buying clothes for the trip, etc. Please note, this aspect of the acronym is something that you will revisit throughout the life of your goal. You will want to continually ask yourself, am I taking action to achieve this goal? If not, you’ve kicked your goal back into being a hope or a dream. Next ask yourself, is this goal Realistic? Another way of saying this is whether the goal is attainable. For example, if you live in a country millions of miles away from Orlando, Florida and you are unemployed and you would have to travel hundreds of miles just to get to an airport, etc., a Disney World vacation may not be for you at the moment. You may not be able to attain this goal in seven months. Of course, faith supersedes natural law, so by all means follow the leading of the Spirit. I am the eternal optimist, but optimism, in my opinion, looks at the circumstances before ignoring them. Do the same with your goals. Finally, ask yourself, is this goal Timely? You must set a time limit on your goals. Otherwise, they will be too vague and relegated to the hope/dream category. In our example, we’ve set August as our time limit for reaching the Disney Vacation goal. It is a clear target, which brings about the focus needed for reaching the goal. 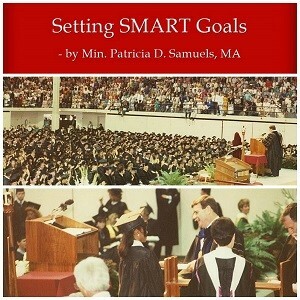 By the way, if you have humongous goals that seem really unattainable, set a target date anyway. You will always need something to aim toward and even if you don’t reach the goal by the target date, you will be very close to reaching it! In our example, let’s say, something comes up and you have to spend some of your vacation savings. Unfortunately, August rolls around and you don’t have all the money. You do, however, have some of the money. So you can just move the target date until you have all of the money. You will notice in August that you are much closer to your Disney Vacation than you were in January.